Monday September 14th 1903 It rained most of the day. Mollie did not come home to her dinner. I put in a good deal of my time sneezing, I have taken cold. I put some apples to dry and did the regular work. Tuesday September 15th 1903 weather a little better today. I put up tomatoes in the morning and sewed in the afternoon. Will is sowing grass seed on his new seeder. worked on a stand cover and talked with Mollie in the evening. weather cold and rainy. 19 years since Rob died. Wednesday September 16th 1903 Will brought corn for me this morning and I put it to dry. We went down home in the afternoon. I brought my sweater home. Hattie had finished it. It is very much colder. 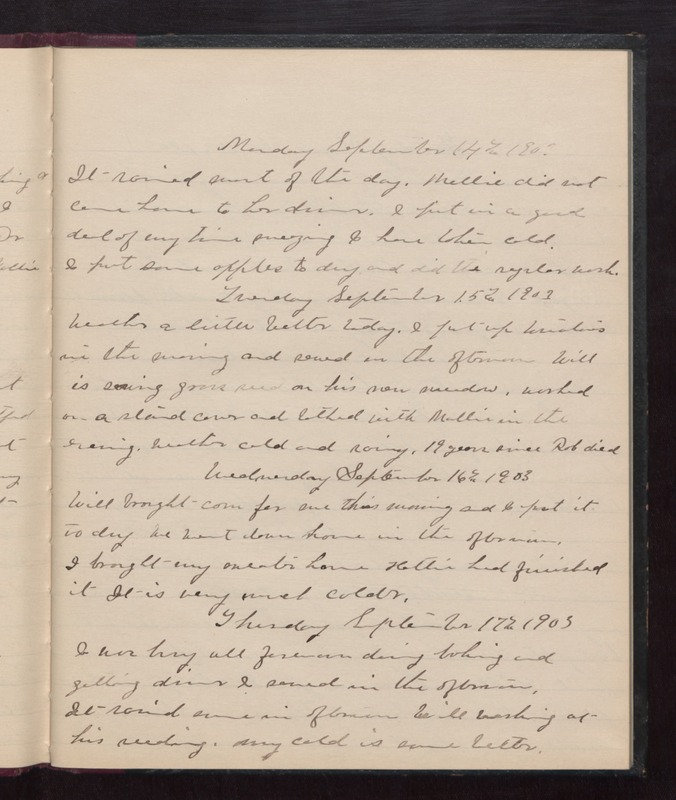 Thursday September 17th 1903 I was busy all forenoon doing baking and getting dinner. I sewed in the afternoon. It rained some in afternoon. Will working at his seeding. My cold is some better.